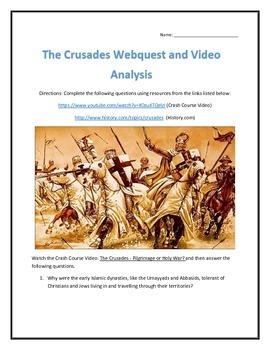 The Crusades Webquest and Video Analysis with Key- this is a 14 page document that contains a webquest and a completed teachers key for easy marking. It contains 36 questions based on a Crash Course World History video and the History.com website. 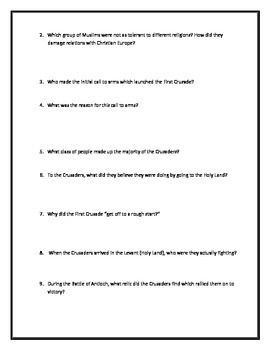 Students will be introduced to the topic of the Crusades by watching the Crash Course World History video: The Crusades - Pilgrimage or Holy War? The video will explain the origins of the First Crusade, the religious mission behind it, and the results of the first major Christian attempt to retake the Holy Land. The video then goes into great detail explaining the importance of the Third Crusade (Richard the Lionheart vs. Saladin) and the shear ludicrousness of the Fourth Crusade (Christians attacking Christians and sacking Constantinople). After watching the video, students will proceed to the History.com website which will ask them to watch a second short video and read the accompanying article. The History.com article will provide important historical information and dates for the early crusades (1-4), the establishment of the Crusader States, explain the sequence of events behind the later Crusades (5-8), and cover the eventual end of the Crusades following the fall of Acre in 1291. 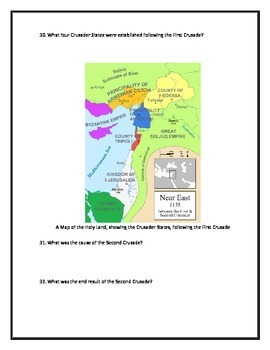 This webquest can be easily used as an introduction to the topic, a study guide, or a quick and easy sub plan.